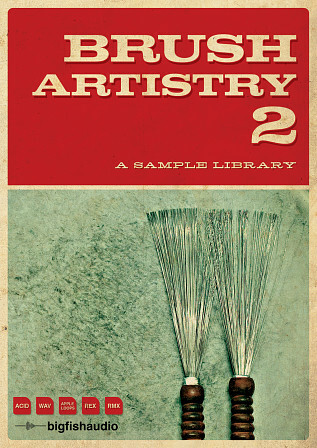 Brush Artistry 2 is a modernized follow up to the classic Brush Artistry collection of loops containing beautifully recorded drums played with brushes. 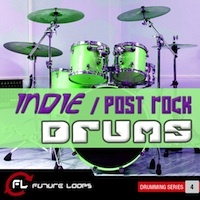 The nearly 3 Gig collection contains 68 drum loop construction kits, each with a plethora of variations and fills for your music. Styles include traditional Jazz Swing, Ballad, Waltz, Samba, and Bossa Nova, as well as contemporary Americana and World grooves. Each construction kit also contains various main grooves, fills, endings, as well as a unique "snare only" track, featuring just the brushes playing on a snare, allowing you to build your own grooves around them with other drum sounds. 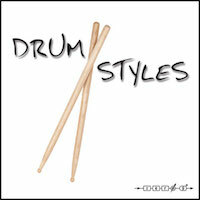 There are two sampled drum kits included with the collection for this purpose. 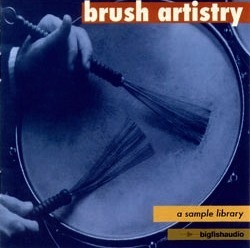 Brush Artistry 2 will give your music the rich warmth and human touch that only real brush playing can provide! The Kontakt version of Brush Artistry 2 is part of our KLI Series and includes patches of each construction kit, allowing for quick and easy arrangements of the parts. 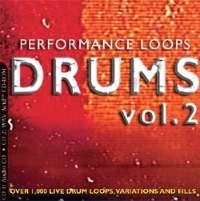 In addition there are "sliced loops" patches which lay out each individual slice of a loop on the keys to create new and original custom parts. Finally, the Kontakt version contains various patches of multi-samples to help you supplement the loops from this library. All in All, we're sure you'd agree that Brush Artistry 2 is the new standard for contemporary brush loops for the modern producer. The Following End User License Agreement is included with Brush Artistry 2. This License is only valid for the individual who has purchased an unopened, new and lawfully made copy of Brush Artistry 2 from a dealer or distributor authorized by Big Fish Audio.